#1,002 Salvage Hunting. 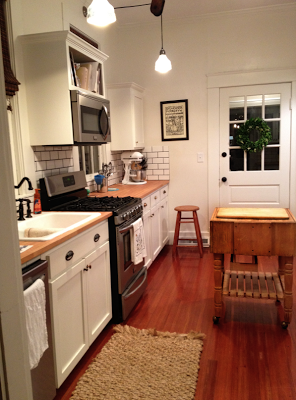 – Laurel Mercantile Co.
Now reading: #1,002 Salvage Hunting. Earlier this year we had an awesome salvaging trip to Jackson and since we’ve got a magazine photo shoot on the horizon in a few weeks, the pressure is on to fill the house with a few more pieces that’ll make it feel more lived in. 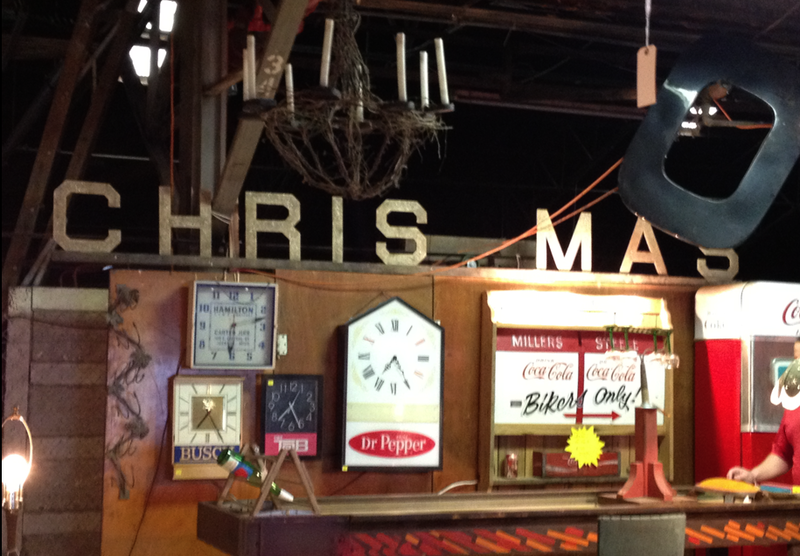 Today we hit the jackpot at our favorite spot, The Salvage Market! We bought this super cool 10′ long Christmas sign that was found in an old convenience store in Union, Mississippi. The ‘T’ is missing in the photo, but it had just been taken down for the cords running through there. It comes with the ‘T’ fortunately. It’s got creamy white glittery letters and we’ll put it on top of the bookcases in the living room the day after Thanksgiving. It won’t be part of the photo shoot, but it’s my favorite thing we found. 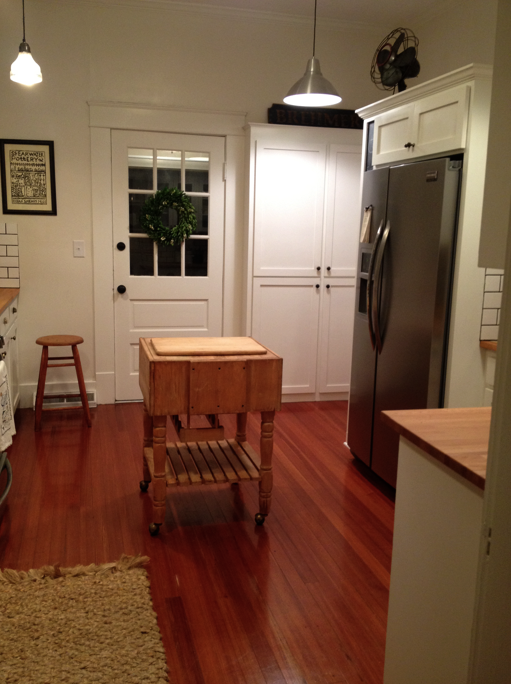 We also found this small butcher block island for $50 and I couldn’t leave there without it. Even if it ends up being awkward in the kitchen, I could sell it for more than we paid. I feel like the kitchen’s a little too sterile looking and I wanted to throw in something a little rougher. Isn’t it cool? And we found this weird porcelain bust of Elvis that they threw in with the Christmas sign and I’m going to paint it glossy white and put him on a bookshelf too. 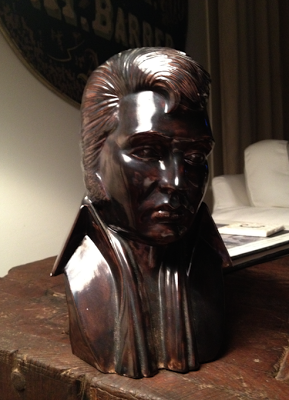 Every home where an Elvis fan resides ought to have a little Elvis on display somewhere. My mama has a Graceland Christmas village, so it’s genetic for me. 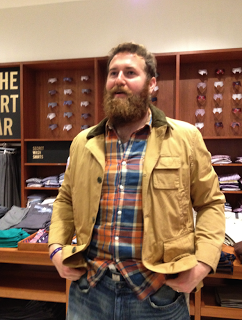 Then we scooted over to the mall in Madison to take a peek in J.Crew and Anthropologie. 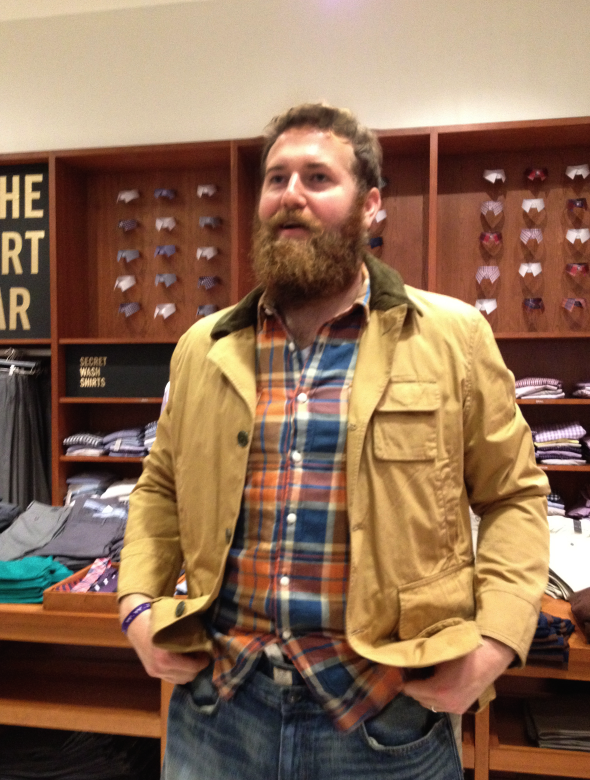 Ben was beside himself because for the first time ever he can fit in those awesome men’s clothes at J.Crew. We bought this great orange and navy plaid shirt for our Vermont trip. The cool barn jacket, however, wasn’t in the budget. Sorry, Mitter. I bet St. John’s Bay makes a nice alternative. #1,003 The First Day of Fall Weather.